Far underground, deep in a remote area of the Appalachian Mountains, lies the Coldbrook facility where, for ten years, Jonah Jones and his team have been trying to open a doorway to a parallel Earth. Three weeks ago, they succeeded and have been watching “the breach” ever since, gathering samples and preparing for the inevitable moment when a chosen few will cross over to see what lies beyond. Before that can happen, something comes through from the other side; something that may once have been human. Unaffected by the electrical field designed to kill anything that comes through, the creature grabs hold of the nearest scientist and bites. Holly Wright, thinking fast, sends the facility into lockdown, but it is already too late. The creature from the other side is carrying a virus and has already begun to spread it. When one of the scientists breaches lockdown and makes it to the surface, he inadvertently unleashes apocalypse upon the world, as the disease spreads like wildfire. But there is hope: a girl, bitten but unaffected, may hold a formula for the survival of the human race in her blood. They just need to get her back to Coldbrook in one piece. I first discovered Tim Lebbon around a decade ago when someone recommended that I read his collection White, And Other Tales of Ruin. I was immediately hooked, so it was with no small measure of excitement that I cracked open Coldbrook, Lebbon’s take on the zombie novel. From the outset, it’s easy to tell this is something different: there’s a reasonable explanation for the outbreak, and a plausible explanation for the rapid spread of the disease: these zombies aren’t the traditional variety, chasing braaaaaiiiiins for their tea; they are people infected with a deadly and aggressive virus whose one goal it forces them to pursue with single-minded intensity: to spread itself. They are fast and, perhaps most frightening of all, they are patient, prepared to wait quietly outside your door until you believe the danger has passed, or have no other option but to step outside. In amongst all the fun horror and buckets of blood, Lebbon takes time to examine how individuals might react in the face of oncoming doom. Family plays an important part in the story, and it is through this lens that Lebbon contrasts the stories of Vic Pearson – who risks everything to get his family as far away from Coldbrook as he can – and Sean Nott – no less dedicated a father, but whose daughter is in France, unreachable, her fate a mystery. Here, too, a look at community, as the initial sense of “every man for himself” gives way to a concerted effort to reach safety in a larger group. Inside Coldbrook, Jonah and Holly find themselves facing a different set of trials, as we discover what lies on the other side of the breach, and the shadowy Inquisitor begins to shadow Jonah’s every move. What came as a pleasant surprise as I read Coldbrook was the unsettling sense of fear that it manages to instil in the reader. This is, after all, “only” a zombie novel, and we hardened veterans of the horror genre should have seen it all before. But Lebbon has more than a few surprises up his sleeve and, despite borrowing from a handful of the genre’s classics – the most obvious echoes here are of The Andromeda Strain and The Stand – still manages to produce something original and scary. Lebbon sets out his stall early in the novel as he presents the moment of outbreak from the point of view of Jonah. What makes this interesting is that Jonah is not in the room with the zombie, and is listening to the events on the phone. Because he can’t see what’s going on, neither can the reader and it puts us on edge. It’s a feeling that persists throughout the book. There is plenty to like here, and the good points far outweigh the bad – a number of coincidences that just seem too trite, too neat. Lebbon paints a believable picture of a world that is rapidly falling apart – burning cities, army quickly deployed and even more quickly overrun, airspace patrolled in a vain attempt to keep the disease contained – and populates it with a group of people that it’s hard not to root for, even if we don’t necessarily like them. The climax, always a tough nut to crack in this type of novel, is satisfying and thought-provoking. This is no read-and-forget pulp horror; there is plenty of food for thought here. In a welcome return to pure horror, Tim Lebbon has put a fresh twist on an old trope, and come up with Coldbrook. Fast-paced, blood-soaked and zombie-filled, it still manages a coherent and engaging storyline with an unsettling edge. I’m not afraid to admit that this one made me wary of turning off the lights at night, which puts it a cut above most of what’s out there in the resurgent tide of zombie fiction. Lebbon remains a solid, reliable writer who deserves to be better-known outside horror. 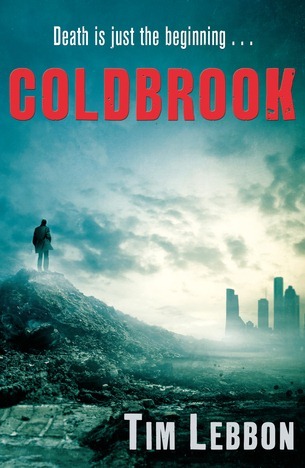 Whether you’re new to the genre, or suffering zombie fatigue, I can’t recommend Coldbrook highly enough to you. Read it, enjoy it and, while you’re at it, hunt down some of Lebbon’s older horror novels. You can thank me later.